At a football pitch next to Victoria Harbor in central Hong Kong, kids can be seen dribbling, running and scoring goals. In the background small Chinese fishing boats, local ferries and international cruise ships slowly pass by. It’s almost idyllic. But the number of children playing for the team could have been considerably higher. Some parents have pulled their kids out of the club because of the ships vomiting out toxic smoke. Road traffic and factories are often, and correctly, blamed for the deadly smog that pollutes the air in south China and elsewhere across Asia. But every year tens of thousands of people die because of air pollution from the dirty bunker fuel ships burn. For cruising companies — which are dependent on upholding a glamorous image to attract tourist — the issue is becoming an increasingly sensitive topic, with several green groups slamming the industry for negligence and paying lip service. According to Cruise Lines International Association, the industry’s main trade group, the cruise ship industry is now one of the fastest growing sectors in the mass tourism market, with 24 million passengers expected to sail in this year compared to 15 million a decade earlier. Hong Kong received 260,000 cruise passengers last year, twice as many as the year before, according to the Commerce and Economic Development Bureau of Hong Kong. At the same time, pollution increases. 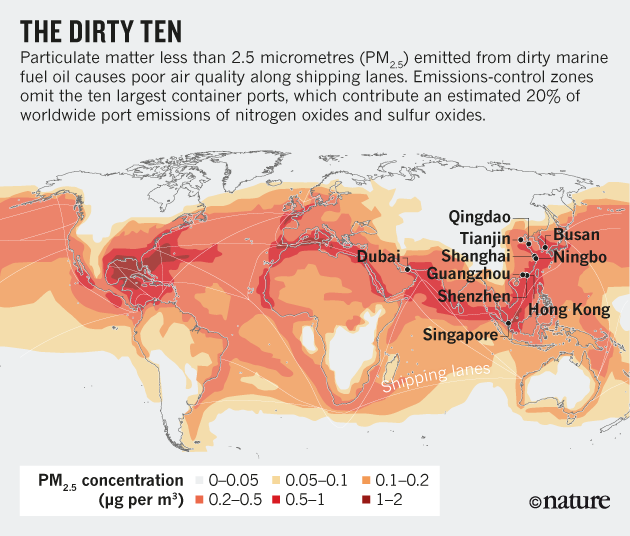 The shipping industry is by far the world’s biggest emitter of sulfur, with the sulfur dioxide content in heavy fuel oil up to 3,500 times higher than the latest European diesel standards for vehicles. Sulfur dioxide is responsible for deadly lung and heart diseases and may contain carcinogenic particles. Each day when an average cruise ship is at sea it emits more sulfur dioxide than several million cars, according to the US Environmental Protection Agency. It can burn as much fuel in a day as a whole town. But even at berth, cruise ships keep their engines running to provide electrical power to passengers and crew. Just imagine a car park with all cars having their motors on, day in day out. Indeed, sulfur dioxide emissions of ocean-going vessels at berth accounts for 40% of its total emissions during its stay in Hong Kong, according to the government. Large ships make up one-third to half of airborne pollutants in Hong Kong. A China-led report published in Nature Climate Change in July said that ship pollution caused an estimated 24,000 premature deaths a year in East Asia. About three-quarters of deaths were in China. “It is time to crack down on the emissions and destructive development caused by vast container vessels that pollute the air and seas,” a group of Chinese and American academics recently concluded in another Nature article. Progress is being made in green shipping, with new technology and tougher regulations. Cruise ships can install smokestack scrubbers to remove sulfur dioxide, burn lower-sulfur fuel or use liquefied natural gas. They can plug into shore-side power rather than running their engines while in port. “The direction of the cruise industry is that it is becoming more and more environmentally conscious,” Thatcher Brown, President of Dream Cruises, a new premium line owned by Genting Hong Kong, said in an interview. Jeff Bent, Managing Director at Worldwide Cruise Terminals, operator of Hong Kong’s Kai Tak cruise terminal, said that the industry often was being portrayed unfairly and that much advancement was being made. Last year, Hong Kong was the first port in Asia to require all ocean-going vessels (OGVs) to switch to low sulfur fuel at berth, with more parts of China following suit. 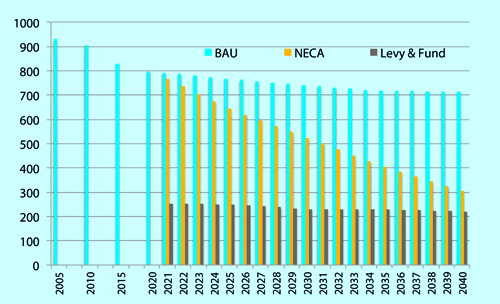 Worldwide, the UN’s International Maritime Organization (IMO) plans to cut the sulfur limit for ships’ fuel to 0.5% from 2020 from a current 3.5%. “I would say that with the fuel switch regulation in place, and lines installing scrubbers, the race for cleaner air is on,” Bent said. Cutting sulfur levels is a good start, says Bill Hemmings, marine expert at Brussels-based Transport and Environment group. But more has to be done to restrict the deadly pollution. A report released in June suggested an “ongoing lack of initiative by cruise companies” to address the liners’ environmental footprint and to install technologies that reduce their air and water pollution impact on travel destinations and local people. “Despite its PR blitz regarding installation of new pollution reduction technology, the cruise industry continues to get an ‘F’ for transparency, and many are failing when it comes to air or water pollution or both,” Marcie Keever, oceans and vessels program director for environmental activist group Friends of the Earth, said in a statement. “Cruise companies create a picture of being a bright, clean and environmentally friendly tourism sector. But the opposite is true,” he said. And while happy cruise passengers continue to sail through the Hong Kong harbor, children playing football at the waterfront pitch will continue to fill their lungs with the ship’s toxic smoke.